The Paras Trinity commercial complex is a perfect example of this. Located is a prime area, its unique and futuristic architectural design makes it yet another eminent landmark from us. Go on, enter a world that’s been inspired by you. Besides incorporating state-of-the-art office space, it will have the known brands under its retail wing. Two floors solely dedicated to retail spaces, Paras Trinity is here to set a new trend in shopping by featuring some of the most renowned designer shops and studios, thereby, creating a new benchmark for the commercial real estate Gurgaon. Your office now comes studded with the ultra modern amenities. Your business is set to witness new dimensions. 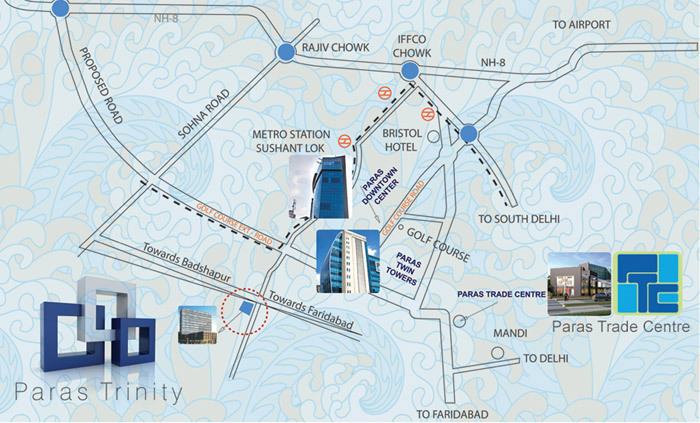 Boasting of rich landscape surrounding your workspace, Paras Trinity make sure that you never wear out. Plush architecture with the state-of-the-art infrastructure will make it the most coveted commercial property in Gurgaon.